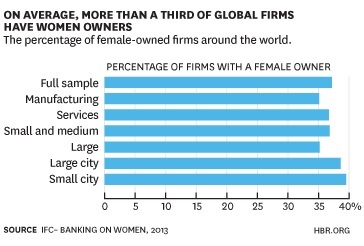 Women entrepreneurs have become an integral part of today’s corporate world. Not only are they able to equalize their duties of both motherhood and entrepreneurship but also they comprise of almost half of all businesses owned. Today, more women are breaking free from the traditional, gender-specific roles and venturing into the business world. The last decade has witnessed a dramatic increase in both- the number of women entrepreneurs as well as the success rate of their initiatives. From being a minority in the entrepreneurial ecosystem ten years ago ,women today comprise of 37% of the world’s total entrepreneurs. The recent Global Entrepreneurship Monitor (GEM) found 126 million women starting or running businesses, and 98 million operating established (over three and a half years) businesses. That’s 224 million women impacting the global economy — and this survey counts only 67 of the 188 countries recognized by the World Bank. Much of a business woman’s drive to pursue entrepreneurship is due to the immense passion she has for her work. Another motivating factor behind women entrepreneurs is the desire for control. Many successful female business owners are provoked by the opportunity to be their own boss and run their own company, a prospect that would never occur if they had worked for someone else. Their primary goal is not monetary reward but rather personal satisfaction and community involvement. Another inspiring component that many successful women entrepreneurs share is the fact that they have the ability to multitask and also the tendency to balance family life and career with their goal-oriented approach. Women are now overtaking their male peers in every field. When it comes to education, having higher education degrees is one of the most significant characteristics that many successful female entrepreneurs have in common. Women entrepreneurs also tend to offer better health care benefit packages, on the job training and education, more tuition reimbursement for students and continuing education employees and provide more vacation and paid leave options to their staff thus leading to the prosperity of the firm. 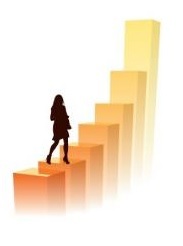 Women entrepreneurs are assembling themselves into groups or confederacies. The reasons behind this trend have to do with the desire to establish solid women business networks, where members can collectively pool resources and expertise together. Also the government schemes and the numerous women Entrepreneurship associations like Federation of Indian Women Entrepreneurs have been instrumental in providing an incentive as well as the resources to step into the world of entrepreneurship. It’s no coincidence that states with higher literacy rate have more number of women entrepreneurs. In fact, women entrepreneurs in the four southern states and Maharashtra account for over 50% of all women-led small-scale industrial units in India. Even though female entrepreneurship and the formation of women business networks is steadily rising, there are still many prospective women entrepreneurs who do not follow through with their great business ideas. Many prospective women entrepreneurs may fear the debt associated with their start-up. A second challenge may be their lack of knowledge in information technology and business skills. Despite of all the problems faced by women entrepreneurs there are many promising predictions for them in the near future. Even though many successful business ventures are IT-related, there are many other thriving industries that do exist and are flourishing. Experience is always an advantage; however, one just has to conduct ample research on their industry, their consumer base and competitors, and speak to entrepreneurs who have already gone through the process. Moreover, many such coalitions will be formed among female associates, enabling the establishment of female business networks to flourish in the business world. Entrepreneurship is a learning experience and even the most successful business owners have had to learn new things throughout the development of their company. Entrepreneurial activity creates growth and prosperity ̶ and solutions for social problems. 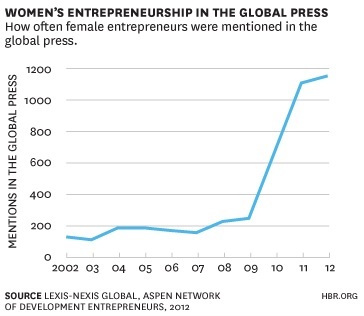 And today’s trends show that women will be a driving force of entrepreneurial growth in the future.